Making an effort to keep a loved one socially engaged can keep him or her feeling upbeat and joyful. Since people who have dementia tend to suffer from isolation and depression, an outing can provide a loved one with something to look forward to, and it livens up the day-to-day routine. 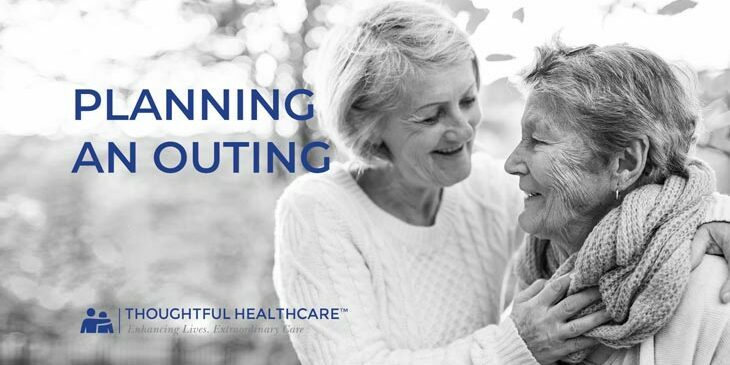 In the “Planning an Outing” video, you’ll find helpful tips and ideas for getting your loved one out and about in a safe way. Make sure check the details of the venue. Is it easy to get in and out of the building? What is the parking situation? Are restrooms easily accessible? Avoid choosing an event that is too loud or too long for a person with dementia. This can help prevent outbursts. Try to bring a third person in case you need to get food or run to the restroom, ensuring that the person with dementia is not left alone. Manage expectations. The outing might not be what you expected—but, it will run more smoothly if you plan well. Breathe, smile, and enjoy the time with your loved one. Professional caregivers can help you and your loved one enjoy life. At Kansas City Home Care, we are here to support you, and can help plan and attend outings with your loved one regularly. Please feel free to contact us for more information. Watch the “Planning an Outing” video below.